The East Bay's new community choice aggregator aims to lower energy bills and greenhouse gas emissions while creating new jobs. But does it go far enough? EBCE CEO Nick Chaset said community involvement was central to the creation of the local development business plan. But EBCE is a new kind of community choice program, according to the unprecedented coalition of labor and community organizers whose years of advocacy helped to shape it. "The centerpiece of what makes EBCE different is the ability of the community to benefit from the development of renewable energy," explained Al Weinrub, executive director of the nonprofit Local Clean Energy Alliance. Last month, EBCE released a plan for making that happen. The draft "local development business plan" details strategies for creating local jobs, providing pathways to good jobs for disadvantaged workers, providing the benefits of clean energy to people at all income levels, and reducing pollution in communities where it's worst. Initially, EBCE will not have the capital for big investments. But it can immediately start working toward those goals by using its power as a purchaser of electricity. For example, EBCE proposes to pay higher rates for locally produced electricity and to give preference to union contractors, especially those with links to training programs for disadvantaged workers. It might also serve as a "developer" to help customers join together to create large solar-energy projects, thereby lowering installation costs through economies of scale. The East Bay Clean Power Alliance, a coalition of community organizations that has been leading the campaign for local development, says the draft plan includes a lot of great ideas, but faults it for failing to set priorities or standards for evaluating programs. And Dave Thoni, former president of the International Brotherhood of Electrical Workers Local 595, said, "significantly more needs to happen" to create jobs for local workers. One of EBCE's first projects will be helping cities put together big contracts to install rooftop solar panels on many municipal buildings. The same model could be used to combine residential rooftop solar projects in a neighborhood. EBCE will help by organizing these collaborative projects, streamlining permitting and administrative costs, and creating a revolving loan fund. In addition to lowering costs, the goal is to make projects large enough to be done with a union contract, so solar installers can earn more than many currently do. This creates the potential to overcome the chronic conflict between environmental groups and unions about local solar energy. In the past, some unions have opposed plans for rooftop solar because the workers who install the panels are often poorly paid. Because community involvement was central to the development of the plan, said EBCE CEO Nick Chaset, it reflects community priorities such as "equitable access to things like rooftop solar." Electricity companies now pay a standard rate to customers with solar panels for extra electricity they sell back to the system. The plan calls for giving low-income customers a higher rate — an "adder" — for the electricity they sell, to make up for some of the cost of installing solar panels. The plan also calls for a pilot program of "community shared solar" in order to "bring the benefits of solar to people who aren't homeowners or couldn't afford to do solar on their own," said Megan O'Neil of the East Bay Shared Solar Collaborative. Those households will be able to join a project to build solar panels on a central location in the community — say, the roof of a church or public building — and then share the savings. And the plan calls for a Community Investment Fund to provide grants for innovative energy projects by community groups. EBCE is already starting to enroll commercial customers. Residential customers will come online in November, unless they "opt out" to stay with PG&E. Bills will immediately go down, unless the customer chooses to pay more for electricity that's even greener. For most customers, EBCE's default rate is set at 1.5 percent below PG&E's rate, and will include more electricity from renewable sources. Or customers can decide to keep paying the same rate as PG&E so they can get electricity that's 100 percent "carbon-free." However, that includes power from large hydroelectric projects, which the state does not count as renewable because of the environmental destruction and greenhouse-gas impact of building and operating big dams. So, after a push by environmental groups, EBCE added a third, higher-priced choice that's all from "renewable" sources such as wind and solar. In any case, the initial savings on electric bills will be modest, said Barbara Stebbins, a volunteer with the Local Clean Energy Alliance. Larger savings will come to those who take advantage of EBCE's programs to help retrofit buildings to be more energy-efficient. In addition, EBCE plans to lower the cost of electricity for the whole community by tackling the problem of peak demand. Electricity use varies a lot by time of day and time of year. Solar panels produce energy during the day, while more electricity is used in the evening. All these timing problems mean electricity providers end up meeting peak demand by buying electricity on the short-term market, when it's most expensive and carbon-intensive. 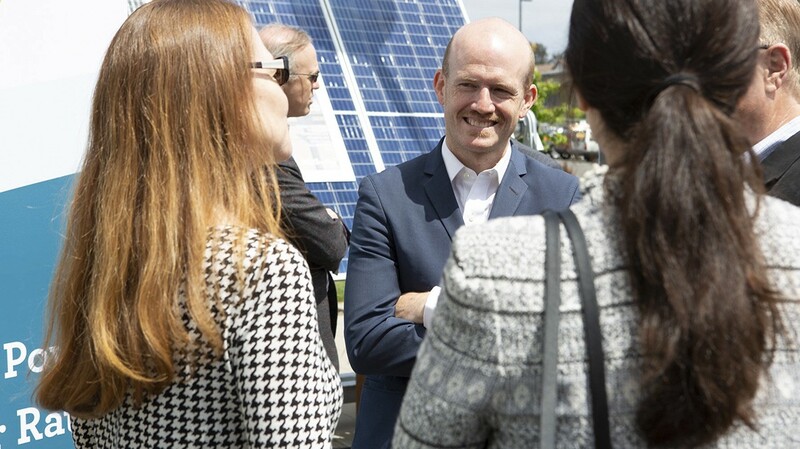 The EBCE plan includes several strategies for solving this problem: Customers with solar panels who install batteries will also get an "adder" on the rate they receive for selling electricity back to the system. They also may be able to gradually pay off the cost of the battery as a small extra charge on their property tax or electricity bill. Customers who install batteries won't have to draw extra electricity from the system at night or when they turn up their air conditioner. Beyond that, EBCE is looking to develop a "virtual power plant": Customers will get financial incentives to use less electricity during times of high demand, and to allow the system to draw electricity from their batteries when it needs additional power. Despite the shared excitement about these innovative strategies, some renewable energy advocates say EBCE isn't doing enough to promote local solar- and wind-energy projects. Thoni of the IBEW pointed out that the agency's proposed 2018-19 budget allocates just $2 million for local development and includes no specifics about which projects the money will fund. EBCE's first request for bids from electricity producers demonstrates how it's using its purchasing power to promote community priorities: It says EBCE will give preference to suppliers that develop new renewable energy capacity, have union contracts, hire Alameda County residents, and work with job-training programs for disadvantaged workers. But Thoni pointed out that the request for bids includes a goal of developing just 20 megawatts of renewable energy generation capacity in Alameda County, which would supply less than 1 percent of the amount of electricity needed. Chaset struck a cautious note in discussing local energy generation. "We expect to be able to buy large-scale solar [from elsewhere] in California for very, very competitive rates," he said. "We can have more impact if we use large cheap solar than expensive rooftop solar." Thoni responded that consolidating rooftop solar into large local projects can provide economies of scale that bring down the cost to be comparable with utility-scale solar, as has been done in Germany. And when Alameda County buys electricity from corporations with huge solar arrays in the desert, many of them fossil fuel companies like Mobil and Exxon, "every penny goes out of the county," he said. EBCE's mandate is not just to develop local jobs, but to further what Thoni says his union is already doing — providing pathways to good jobs for disadvantaged workers. In its comment on the local development plan, the East Bay Clean Power Alliance praised many parts of the proposal but pointed to some "important enhancements needed." It says the plan's list of key strategies should highlight those aimed at "increasing equity and ... social justice." These include "adders" (higher rates paid for electricity) to promote community benefits, partnership with customers (like the "virtual power plant" deals), and measures to protect the most vulnerable communities. In addition, the coalition calls for quantifiable standards for measuring the success of the plan, such as local hires, projects in disadvantaged communities, project ownership by low-income people, hires from communities of color, and progressive electricity rate structures. The coalition that pushed for the local development plan — including the Local Clean Energy Alliance, the Sierra Club, the International Brotherhood of Electrical Workers, the California Nurses Association, and others — intends to continue the advocacy that has helped shape EBCE. Utility companies, meanwhile, are not sitting idly by while solar panels and community choice systems take away their customers. They've proposed a stream of legislation and regulations that would hamper the development of community choice programs. Other proposals seek to limit or eliminate payments to customers with solar panels for selling extra energy back to the system. A state law bars utility companies from lobbying against community choice, but the IBEW local that represents PG&E workers has served as a stand-in for the company. And the utilities have recently asked the California Public Utilities Commission to lift that ban. Recently, the CPUC adopted a rule that forces new community choice agencies to wait longer before coming online, making it trickier to finance new programs. But meanwhile, said Chaset, community choice programs like EBCE are starting to provide "an opportunity for customers and communities to have a say in how much their energy costs and where it comes from."